This past June I had the pleasure of paying long time TFL member Ananda/Andy a visit for a few days at his home in Powburn,Northumberland , UK. Any of you who have read his most recent blog post Fresh Loaf Visitor will know this already. I floated the idea past Andy back in the Fall of 2012 after I'd learned my wife Marie would be attending a four week professional development course in Prague CR. We'd decided to take our summer vacation together in the Czech Republic after her course was finished so I thought that as long as I'm hopping the pond anyway why not take a slight detour to the UK and have a visit with Andy. Andy's immediate response was something like Yes, absolutely, come on over and we'll do some baking together! Over the next few months we confirmed dates and arrival times etc and chatted about what we might bake. As it so happened the first Saturday of my vacation time coincided with The Hexham Farmer's Market that Andy and his partner Nigel bake for on a regular basis using Nigel's large wood fired oven. I'd been hoping to have a chance to see this massive WFO that Nigel built, since seeing it featured in one of Andy's blogs a year or so ago. Now I'd have the opportunity to actually see it in action. If timing is everything it seems that I nailed it! The journey from Vancouver Island to Powburn was epic, taking 3 planes, 1 train and 1 automobile. One short hop from the Island to Vancouver Airport, then an 8 hour layover before the 9 hour flight to Amsterdam with an hour + there. Then a 1.5 hour flight to Glasgow, followed by a 2 hour train trip to Almouth Station. Bleary eyed and somewhat worse for wear and tear I stumbled off the train to be warmly greeted by Andy. We tossed my luggage in the back of his car and drove on to his home in Powburn. A long journey but worth every minute of it! After a delicious meal (and a few fine British brews) with Andy and his charming wife Alison, I was fading fast. We had a full day of baking ahead of us the next day and I was desperately in need of a good nights sleep, so said my good-nights and hit the sack for an unheard of 11 hours! By the time I joined Andy the next morning he was already hard at work mixing dough, and prepping the work area for production. After a chat over coffee we got right to it, making a variety of loaves, some of which were made using flours I'd brought over for Andy to try. and the paragraph below it for a complete description of all the breads we made. One of the things I was most interested to see was how Andy makes his rye paste for his spectacular 100% rye breads, specifically the consistency or viscosity of the paste. In my own mixes of 100% rye paste I've had some good results but have also had an awful lot of poor ones as well. My hope was to learn first hand what sort of feel Ishould be looking for in a 100% rye paste. Hydration percentages are all well and good to put you in the ballpark for mixing a dough or paste, but no substitute for being able to actually feel what a properly hydrated and mixed one is like. I believe I have a much better idea now and hopefully I'll be able to achieve better, more consistent results in my own high ratio rye breads thanks to Andy's expert guidance. We had Andy's WFO loaded up somewhere around noon as I recall but I was still quite jet lagged so I can't say for sure. Andy had some calls to make so I headed down the street to the pub for a pint and to write some emails. When I returned we pulled some of the loaves from the oven and Andy slid in a pan full of various vegetables he'd chopped up and drizzled with olive oil to roast for our dinner that night. Top baker and a great cook as well! Later on, after we'd cleaned up the kitchen and all the loaves were out of the oven and cooled, we took them outside on the sunny patio and had a photo op of our days work. We were both pretty happy with how things had gone and felt we'd made a good start on the production for the Hexham Farmer's Market. On top of that we'd enjoyed working alongside each other, almost as if we'd been doing it for years instead of hours. Andy is a very easy and amiable fellow to be around. Thoughtful, and with strong opinions on a variety of issues, we had some interesting conversations, bread related and otherwise, that day and throughout my visit. Early the next morning we were back at it getting things ready to take to Nigel's. There were a couple of problems we had to sort out first involving a levain that was past prime, and an uncooperative spelt dough, but we had those fixed soon enough and began loading up the car with the doughs, soakers and various bannetons, tins, etc that we'd need for that day, then set off for Nigel's. Meeting people for the first time one can never be certain how they'll be received, but if I had any doubts they vanished within the first few minutes of meeting Nigel. Nigel is one of those people you meet and feel comfortable with right away. Friendly, great sense of humour and bit of a raconteur, I enjoyed working and chatting with him a great deal. He and Andy had a brief conference on the production plan for the day while I got the car unloaded and ran some items down to the oven enclosure. Basically the day went like this; Nigel and I divided, scaled, and rounded/shaped all the doughs, getting them into bannetons and tins while Andy was back up in the kitchen mixing. When the various doughs were ready for baking I took a position just inside the door so that Nigel had plenty of room to swing the peel when he needed to and then watched as the other two bakers loaded the oven. To watch these two fellows work together is like seeing a well oiled machine in operation. Perfectly synchronized, with no wasted movement and effortless speed, I'm kicking myself now for not taking a video of it to show here. Nigel would lay the peel on the outer hearth, sprinkle it with semolina, immediately followed by Andy tipping a loaf on to the peel and giving it 3 quick slashes. As Nigel was placing the dough onto the hearth floor Andy was reaching for the next basket to tip on to the peel, having it ready by the time the peel was on the outer hearth again and then the sequence would repeat itself. My best estimate for their loading cycle is10 seconds or less. Very enjoyable to watch this process done so quickly and efficiently and quite clear to me that the two of them have made and baked a lot of bread together over the last few years. One hundred and thirty loaves later, followed by a shop cleanup, Andy announced we'd finished in record time, so I was quite pleased to have made a small contribution to that, and to the product we turned out that day. The oven is impressive, not only for it's size but how well it does what it's supposed to do. Since I was the designated un-loader, I was able to see every loaf as it came off the hearth, marvelling at the consistently even colour of all the loaves. No scorching or mottling to speak of no matter what area of the hearth I pulled them from. Nigel told me he'd spent 2+ years building this beast to have it the way he wanted it. Apparently all his hard work has paid off in spades, the end result being one helluva nice piece of baking equipment. We packed up and left Nigel's for a drive through the countryside before picking Alison up from work, then picked up some fish and chips for our dinner that evening. I guess Chef needed a break from the oven for some reason or another. No complaints from this diner though, the fish and chips were delicious! On Saturday morning we packed up the car again, this time with the breads we'd made on day 3 along with baskets for displaying the breads and the pieces for setting up the stand once we arrived at the market square in Hexham. Nigel arrived with the breads we'd baked the previous day and stayed for a few minutes to chat, then was off on another errand after wishing me a happy vacation and safe travels. The weather was iffy, with some dark clouds lurking around but some sun coming through as well. We set up the stand and put out the breads for display but the first hour sales were slow, just 3-4 loaves as I recall. However once the sun began to show a bit more so did the crowds and things got busy pretty quickly. It was interesting to see people approaching the market, looking around, then zeroing in on Andy's stall as if to confirm that yes, he was open for business and once again they could purchase his bread, or perhaps seeing his booth for the first time and being drawn to the variety of gorgeous hand crafted breads he had on display. Whatever their reason was, I can tell you that his breads are extremely popular with the market clientele, a good number of people buying 2 or 3 loaves at a time, some saying they freeze the loaves to tide them over till the next Market day. 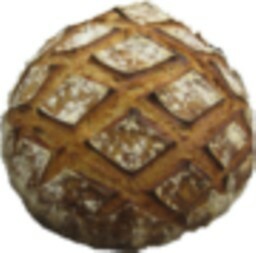 The pitch for anyone on the fence about buying was “The loaves are made from all organic grains and flours (local when possible), natural leavens, hand crafted and baked in a wood fired oven”. Some folks would have specific questions of course, usually regarding sugar and fat content, but for the most part the breads sold themselves. Not sure, but I think we sold the bulk of the stock in a little over an hour, with people coming in waves every 15 minutes. I haven't done any one on one selling like that since my bar-tending days back in the eighties and it took a while to get back in the groove but I managed to get by alright. The toughest part for me was making change with an unfamiliar currency, having to look at every coin to make sure I was giving correct change. I'd smile, tell them I was visiting from Canada, they'd smile back, often welcoming me to the UK and then wait patiently while I put their change together for them. Luck for me Andy has very polite clientele. Well eventually we sold all but one loaf, a miche, which Andy traded with the artisan cheese maker nearby for a round of goat cheese. I bought some amazing Italian dried sausage, Coppa, from the artisan charcutier immediately behind us, and the two of us chatted at length about making air dried and fermented sausages, something I intend to start making for myself in the next year. Since we sold out before anyone else we were the first to pack up and leave the market, driving straight back to Powburn. After 3 days of making and selling bread it was time to kick back and enjoy some down time. We had a little lunch of bread, goat cheese and ale on Andy's terrace with the sun beaming down, talking of the days sales and of his plans for his proposed bake shop location, just a five minute walk away from where we were sitting. I fully expect that by the time I'm able to return for another visit in a few years time his shop will be a well established presence in the community and surrounding area. That evening Andy, Alison and I drove to the shore for a walk along the beach, a long and splendid beach, the ruins of a castle perched on a bluff jutting out in the distance. A magnificent photo op if only I'd remembered to bring my Iphone. Fortunately Alison had her phone and got a couple of good shots that she forwarded to me. We wandered off the beach in to a nearby pub for what was one of the best meals of my entire two week vacation. The pub brews their own very good ales and the dinner menu focuses on local products from the fields, farms and the sea. We did have some excellent meals while in the Czech Republic, but this meal stands out as being the freshest and most flavourful one I had the pleasure of eating while away. The next afternoon after saying goodbye to Alison, Andy drove me to the airport in Newcastle where I would catch my flight to Prague and join Marie after 5 weeks of being away from each other. Time to move on, but in the knowledge that the last 3 days had been an experience of a lifetime which I'd long remember. It had been everything I'd hoped for, fun, interesting, productive and a tremendous learning experience being able to work alongside Andy, and then both he and Nigel, and of course the wood fired ovens. The commitment to build my own WFO has never been stronger than it is now but unfortunately it will have to wait till next year due to some unforeseen expenses cropping up. I've put it off so many times already, one more year isn't going to make a difference one way or the other. Below is a bread I made recently using some of the Gilchester's Farmhouse Wheat that Andy was kind enough to share with me before I left. My first notion was to use it in his formula for Gilchester's Miche, but decided to try and stretch it out and to make the flour last longer. The amount I was able to bring back was limited, and as it was I just squeezed under the baggage weight allowed by the airline. Instead of using 75% Gilchester's that Andy's formula calls for, I reduced it to 50% overall and added 38% AP and 11% Red Fife whole. A slight change, but enough to allow me to make a couple of more loaves using the Gilchester's than would have been the case at 75%. The bread turned out well and has excellent flavour from the Gilchester's-Red Fife combination. When I run out of the Gilchester's I may try sifting some RF to use in it's place. Although I know the flavour won't be quite the same, it'll have to do until I can get back to Northumberland. S&F as needed to develop a springy dough. My pleasure Paul, I'm glad you enjoyed it! The experience was so good, on so many levels, it was a challenge to try and stick mainly to the baking aspect of the visit. I've long thought Andy could do very well if he set up a tour of UK bakeries belonging to the Real Bread Campaign that I'm sure would interest TFL members and other bread heads. Being the teacher that he is he'd be in his element holding classes and seminars with the various bakers of real bread in the UK for his tour group. Thanks for your great post Franko. Amazing the connections bread can make....from Western Canada to the UK! A much quicker journey than our/your ancestors made and now you will have the mingling of a UK rye leaven with a BC one....One never knows what life will bring our way. What a fortunate time we live in. Breads are all beauties too. How fun that you got to go to the 'market' with him too. A nice full picture of all that Andy does. We do live in amazing times don't we? That so many of us are able to connect the way we do is quite remarkable considering it wasn't even a concept to consider when we were growing up. It (the web) has opened up so many opportunities and possibilities for us now that wouldn't have seemed possible or likely 20 years ago. So glad you enjoyed the post and the photos. Most of the time I can't see what I'm trying to take a picture of because of the protective cover for my phone, so it's point and hope I get something decent. I either got lucky or I'm getting better at guessing where to aim the lens because I managed to get quite a few nice photos this time. The Hexham Market was a hoot! I really enjoyed myself, and it was great to see Andy and his customers interacting. The bread speaks for itself, so actually selling it isn't something either one of us had to do to any great degree. I feel like I was there - a great read. Your use of Andy'e gift flour turned out perfectly! What a great miche!! Happy baking and glad you got home safe. If you felt like you were there when reading the post I couldn't ask for a nicer compliment than that. Much appreciated! The Gilchester's Sour is a treat to be sure,the best tasting loaf I've made for a while. I just wish I had more of the Gilchester's flour...say 20 Kilos of it to use till I return to Northumberland to get more. Thanks for your good wishes dabrownman. What an adventure. Thanks for sharing this journey. I have to say that Gilchester loaf looks amazing. The crumb and colour....wow. I'm glad I you enjoyed the ride and it was my pleasure to share it with you. I'm fairly happy with the loaf and it's crumb considering that it initially stuck to the brotform I had it in. I had to peel it out, very gently re-round and put it in a floured banneton for a second proof of 40 minutes. No harm, no foul, as it turned out OK in the end. One adventure after another this baking thing we do. You've described your visit so enthusiastically, i feel like i have been part of it all. Your account of Andy, Allison, Nigel, the breads and the market is very interesting and charming. I'm glad you've had the chance to meet Andy upclose. Many thanks and happy that you enjoyed the post. Meeting and hanging out with Andy was a lot of fun, and as I mention in the post he's a very easygoing guy to be with. We share similar views on many things, particularly bread and baking and I feel it would be the much the same for you if the opportunity to visit him comes your way at some point. Hi Franko Glad you enjoyed your time in the UK with Andy. He is a great baker and the photos of his breads make me feel hungry even though I've just eaten a couple of slices of sourdough toast for breakfast! I'm sorry that you didn't have time to visit a few more of us TFLers whilst you were in the UK - perhaps next time :) . Certainly the area where Andy lives has some stunning scenery - provided the rain holds off long enough for you to see it :) . When you are looking to start sausage making you really should sign up to http://forum.sausagemaking.org/ . There is a lot of useful information there and a friendly bunch, rather like TFL, but it is UK-based with a good number of users from North America. Visiting the UK has been on my list for as long as I can remember, and now that I have it's only whet my appetite to see more of it. When I have a chance for a second visit it will be for much longer and hopefully I'll be able to meet you and other UK based TFL'rs. The charcutier, Andrej whom I spoke to at the market gave me an address for a Polish based sausage site *here* that looks quite good. The name of Andrej's comapny is North Wall Charcuterie and if you ever have the chance to buy his products I highly reccomend them.Thanks for sending the link to sausagemaking.org, very kind of you, and I've al;ready bookmarked it. Yes, it did take a while to actually sit down and tap it all out, made even harder by the fact we've been having such wonderful sunny weather here on the Island. It was a marvelous experience to finally meet and get to know Andy a little better, and of course to bake with he and Nigel. As for a hard working vacation, it never seemed like work to me, just fun,although it was quite a bit more involved than what I'd call recreational baking. I regarded myself more as a bench hand or assistant to Andy and Nigel who were the ones who did all the heavy lifting, so to speak. Good to hear from you Varda,and thank you for stopping by to comment. Thanks for posting such a thoroughly enjoyable account of your working visit with Andy. A vicarious treat for all of us, your tale of two bakers, told with characteristic humility and generosity. Between you and Phil/Pips, it's the summer of the Baker's Road Trip. Very kind of you to say so and I'm happy that you enjoyed the rather long read. My experience with Andy and Nigel's market bake gave me a good deal of insight into what I can expect if/when I'm able to do something similar when I retire in a few years. I'll have to catch up with Phil's latest adventure, it's sure to be another of his excellent reads along with his great photography. Alison and I have great memories of your visit. It was great to meet you and enjoy times baking and just hanging out together. I'm so glad you asked to come over so we could meet up, and it's so good to read how much you enjoyed your time in the UK. Your "Gilchesters' Farmhouse Sour" looks like a fantastic loaf of bread. I understand you need to stretch the limited quantity of Gilchesters' flour available. I'm very happy to read of your appreciation of this flour, and have put your generous words in front of the Gilchesters' owners on Twitter; they surely appreciate what you have to say. quick ps. Nigel and I have been baking together since 1987, so we have made lots of bread together...but not just in the last few years! Can't thank you, Alison and Nigel enough for being such gracious hosts and ambassadors to your country on my first visit. I'm hoping to get back for a second visit in a few years time and look forward to seeing you all again. The Gilchester's... oh my, what a fantastic flour to be able to use. If shipping wasn't so cost prohibitive I would have ordered a bag of it already. The bread it made is lovely, staying moist even after several days, and the flavour is just superb. From reading your many posts extolling the virtues of Gilchester's Flour, now I see what you've been on about, it's wonderful stuff. That you and Nigel have been baking together since the 80's comes as no surprise to me after seeing the two of you work together. I didn't mention it at the time but you guys are very impressive to watch while you're loading the oven. I didn't, but somebody should get a vid of that and post it on youtube. 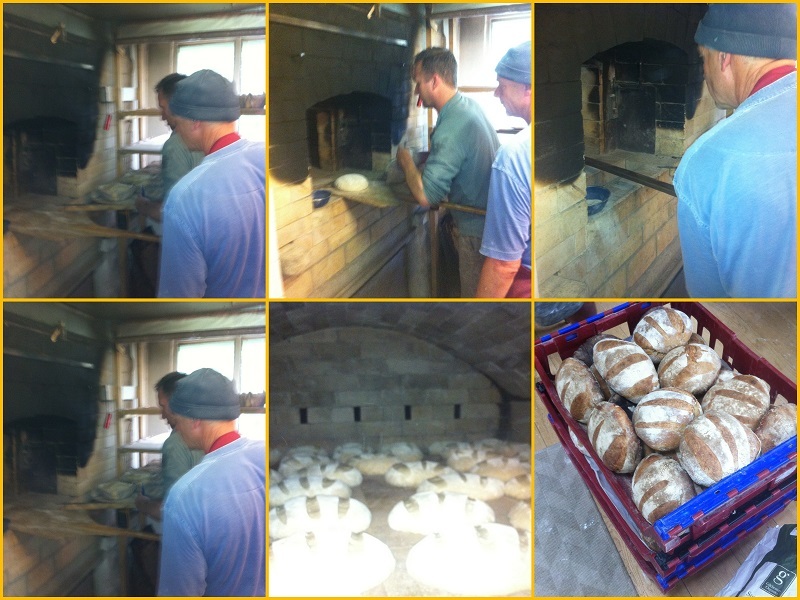 beautiful village and countryside, beautiful breads! It’s really great you could get together with Andy and Nigel – what an opportunity for three talented bakers to meet, and exchange information and experience. Quite an organizational effort getting everything ready to take to Nigel’s and Andy must have been very grateful to have such an able hand. The bread is outstanding and love the photos of the bread baskets - what a display to greet those fortunate customers! I am glad you enjoyed your visit and had such a great trip - it's really scenic and gorgeous there. Your miche is very special indeed, made with such beautiful flour, that you stretched even further by so generously sharing some with me (thank you so much!, and to Andy for sending it along). I completely agree with you - the Gilchester's Farmhouse flour is truly wonderful to bake with. I was able to see a lot of the countryside during the train trip from Glasgow and during the driving we did around Northumberland and can tell you that Andy and Alison live in a particularly lovely area. The countryside of the Czech Republic is very nice as well but Northumberland was my favourite of the two. Happy to share the Gilchesters with you and that your'e enjoying it as much as I am. Thanks for your comments on the loaf breadsong, much appreciated! I loved my vicarious visit with Andy, thanks to your blog, Franko. Thank you! Thanks David, glad you enjoyed it. Andy is a very hard working guy these days and hopefully I was able to capture some of what he does during a market week bake. I think it is so great that the two of you and Nigel could spend time baking and selling at markets. It really doesn't get much more real than that. Thoroughly enjoyed reading your post ... sounds like a fantastic holiday! It was to say the least, an experience I'll never forget. Lots of fun,and a terrific insight into Andy's weekly baking regimen, and his steadfast commitment to traditional craft baking. High ratio rye breads are something I tend to make more of when the weather gets chilly and we're a few months away from that right now, but yes, I hope to be posting a few more of those in the future. Many thanks for your compliments re: the Gilchester's Sour! So, Franco, do tell what you learned about the consistency and handling of rye paste?